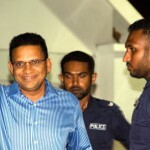 The High Court today cancelled the third hearing into an appeal filed by former defence minister Mohamed Nazim following the Supreme Court’s transfer of two judges on the panel to a newly created appellate court in the south. 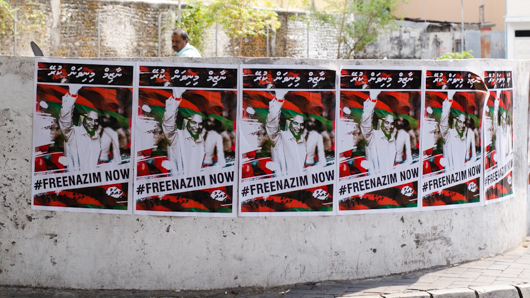 Nazim is serving an 11-year jail term on weapons smuggling charges. The retired colonel maintains he was framed by rogue police officers. Appeal hearings began on Sunday and were to continue daily and conclude this week. The Supreme Court yesterday transferred Judges Abbas Shareef and Shuaib Hassan Zakariyya to the southern branch of the High Court. The two are among the five-judge panel overseeing Nazim’s appeal. A family member said they have not been informed when the next hearing is to take place. There are now a number of issues that could stall Nazim’s appeal. A panel of at least three judges must preside over the case. Two criminal court judges who had sentenced Nazim were recently appointed to vacant seats on the nine-member High Court bench. The High Court has previously said the pair – Judges Abdulla Didi and Sujau Usman – will not oversee the appeal. Of the seven judges left, judge Azmiralda Zahir was also transferred along with Shareef and Zakariyya to the southern branch. This leaves only four judges to oversee Nazim’s appeal. The High Court could proceed with a three-member panel. 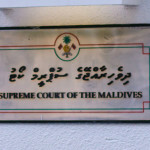 But the Supreme Court could at any time transfer any three of the remaining six High Court judges in Malé to a second regional branch in the north. If any of the two former criminal court judges sit on the Malé bench, the appeal cannot proceed. The division of the High Court into three regional branches with three judges each was required through amendments to the Judicature Act in December last year. The regional branches can only hear appeals of magistrate court verdicts, while only the main branch in Malé can hear appeals of challenges to laws and regulations. Critics have previously questioned the need to divide the high court bench, noting magistrate courts typically only hold trials on petty crimes. The bulk of complicated civil and criminal matters are heard at the Malé’s superior courts. The opposition has described the judges’ transfer to the regional branches as a demotion, and said it will allow the Supreme Court to transfer judges it is not happy with to the regional branches. The apex court’s decision to divide the High Court comes at a much later date than that required by law. The amendments said the Supreme Court must establish the regional branches within 90 days of the ratification of the law. 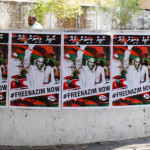 On Sunday, Nazim highlighted several lapses in due process at the criminal court, including judge’s failure to call defence witnesses, discrepancies in testimony by anonymous police officers and police failure to follow standard procedures in the midnight raid on his apartment. State prosecutors on Monday said police are authorised to change their standard operating procedures at any time.